AUBURN - Irene Blouin Lavoie passed away peacefully at Androscoggin Hospice House on Thursday, Feb. 7, 2019, and is survived by a large and loving family who will miss her greatly. 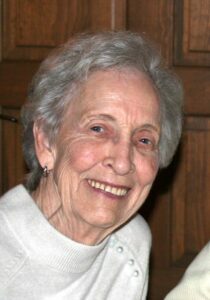 AUBURN – Irene Blouin Lavoie passed away peacefully at Androscoggin Hospice House on Thursday, Feb. 7, 2019, and is survived by a large and loving family who will miss her greatly. Irene was born on May 13, 1929, in Rumford, Maine. She was the sixth child born to Leon and Diana (Brodeur) Blouin. She spent her early childhood years in Rumford, then relocated with the family to Lewiston, where she attended St. Peter’s School, Cours Superieur, and Lewiston High School. Irene married Larry B. Lavoie in October 1949, at the Basilica of Saints Peter and Paul in Lewiston. Irene made her life as a mother and homemaker, and she loved to bake cakes and pies, cook large meals for the family and visit with extended family. She loved to play scrabble, cards and other games. She was a wonderful friend to all and especially loved spending time with her sisters, brothers and in-laws throughout the years. She was always a great listener and made each of her children and grandchildren feel very special and important. Irene is survived by her five children: James of Sun City Center, Fla., Linda Lombard and her husband, Larry, of Mansfield Center, Conn., Frank and his wife, Melanie, of Cumberland, Maine, Janice Bureau and her husband, Dan, of Mount Vernon, Maine, and Brian of Vienna, Va.; 10 grandchildren: Katie Cain, Alison Vandenburgh, Elizabeth Lombard, Shelley Buonacquisto, Andre Lavoie, Alex Lavoie, Bret Bureau, Justin Bureau, Emma Lavoie, and Madeleine Lavoie; seven great-grandchildren: Ronan, Vivienne, Simone, Emmett, Charlotte, Alexandra, and Liam; sisters, Lucille Loubier, Adrienne Desrosiers, Lorena Desjardins, Venise Baril, Pauline Boilard, and brother, Laurian (Larry) Blouin, and many nieces, nephews and other extended family members. She was predeceased by her parents, Leon and Diana; sisters, Germaine and Eva; brother, Raymond, and husband, Larry. The family would like to express its gratitude to the incredible Staff at Clover Manor for their wonderful care of Irene during her final years, as well as to the dedicated and caring staff at Androscoggin Home Care and Hospice. Irene always had a caring heart and positive attitude and will be greatly missed by all. Arrangements for a memorial service will be made at a later date. Anyone wishing to make a donation in memory of Irene may do so at the Alzheimer’s Association Maine Chapter at: www.alz.org/maine.